Blurb- Vaibhav Kulkarni has had few accomplishments worth boasting about in his modest life and career. Yet, his happy universe lies intact in the love and pride his ten-year-old daughter inspires in him. Nisha Kulkarni justifies every reason to be the favourite child of Pune's premier school-be it her academic brilliance, her exceptional facility with music, or simply her unassuming charm. With his daughter showing promising signs of a stellar success story, Vaibhav has made peace with own unrequited dreams of the past. But when the girl mysteriously starts losing mojo and spirals into despair and seclusion, Vaibhav faces the toughest test of his life as single father - to reclaim his child's trust and happiness. What distance will a middle-class man with limited means go to show his daughter the merit in believing in a dream? Read this gripping tale of love, courage, and of the emergence of an ordinary man as an extraordinary hero. 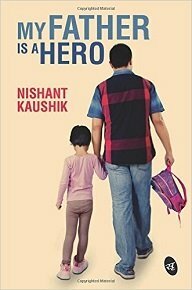 My Father is a Hero is simple yet emotional tale of Vaibhav Kulkarni who is single parent of a 10 year old, Nisha. Book describes the beautiful relationship between Father and Daughter. One thing I liked about the book is Author kept the story real and simple making it more relatable. Book Cover and Cover- Book Cover shows a little girl and her father walking with their back towards the readers. Its simple and appropriate cover however fails to attract readers. It could be made more improved. Title is appropriate as per the content of book. Blurb is short and up to mark. Language and Narration- Language of the book is simple and easy to follow. Narration is done in third person narrative. Narration is done well and glues readers with the book. The book is well edited without any errors. Characterization- Story revolves around Vaibhav Kulkarni and Nisha. Vaibhav is middle class single parent and lives for his daughter. Nisha is 10 years old, talented and loves her father. She's a huge fan of Rihanna. Mr. Kaushik has beautifully portrayed his characters and kept them simple, relatable and believable. The middle class father is portrayed beautifully. Storyline and Plot- This book delivers us fresh story with simple plot. Book is simple tale of Father- Daughter relationship. Their love, misunderstanding and understanding. How one event changes their life and hoe vaibhav tries to get back his life on track. Book is simple without many twists and turns to thrill you but it gives you an emotional tale of Father- Daughter relationship. Storyline is slow paced till first half but it picks the pace in the second half. Climax is beautiful and makes you smile. Overall, My Father Is A Hero is a simple yet emotional tale of Father-Daughter relationship and is a enjoyable read. You can enjoy this book if you're a fan of simple emotional stories. Note- I received free copy of this book from Writersmelon.com in exchange for an honest and unbiased review.